2018 will go down as one of the great British vintages with almost perfect growing conditions and superlative yields across the country. Whilst the climate was the primary driver of 2018’s exceptional performance, in 2019 WineGB is investing in a data-gathering exercise that will significantly improve our understanding of UK vineyard yields across all conditions and regions. With the support of the 2016 ICCWS Committee, WineGB has commissioned the largest grower survey of yield and production variables ever undertaken in the UK. The Survey will be launched in January 2019 with invitations to participate going out to WineGB Members and Non-Members alike. 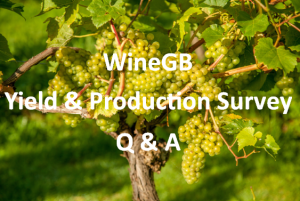 The Survey contains a series of questions designed by leading viticulturalist Stephen Skelton MW, who leads the WineGB Viticulture Working Group (VWG), in association with Wine Intelligence, Veni Vidi Viti Ltd. and Peter Hayes, the highly respected international viticulture consultant. The goal is to increase significantly the industry understanding of the data behind yield variability in the UK. In this first year, the data that is gathered will set the foundations for what will be an ongoing data collection exercise, facilitating better targeting of industry development initiatives, R&D, grower education, public policy measures and private investment. The Survey itself has been developed by Wine Intelligence and the data that will be collected is subject to their strict privacy protocols to ensure that individually identifiable information is kept confidential. Once the data collection is complete, the amalgamated and anonymised high-level results will be made available to the general public, with the potential for in-depth analysis and benchmarking explored on the basis of the quantity and quality of data collected. Throughout January 2019, over 720 emails will be sent out to growers by WineGB, each with a personalised link to the Survey.